At the end of last year VetPartners approached us to discuss working with them as they launched their new company. VetPartners are a group of individual veterinary practices who have joined forces to create a collaborative team. The company has been formed to recruit other practices to join their group. This allows them to offer support to smaller practices wanting to be part of a bigger network, while still retaining their individual identities. We joined the team at a very exciting time; the company name had been officially registered and the brand guidelines had been locked down before we joined the project, but as far as digital goes we had a relatively blank canvas. We discussed the online requirements for VetPartners’ web presence and drew up a plan that would involve a main corporate site in it’s initial stages, with an extranet and further practice sites to come later this year. The team at VetPartners were keen that they wanted to create a new and fairly unique identity for this new brand. 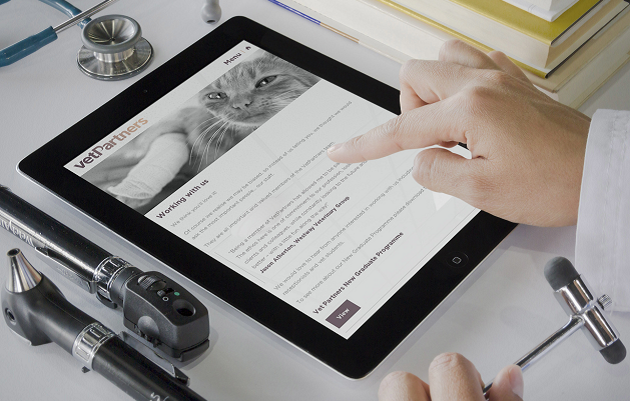 They wanted the overall look and feel to be able to be instantly recognisable as VetPartners, to stand apart from other groups within the veterinary profession. We agreed that most veterinary websites seem to follow the same basic structure and colour-scheme, and are usually extremely wordy. The site will be used to attract new practices, pharmaceutical companies, staff and new graduates so usability is an important factor. Using the brand colour palette we were given in the brand guide we created a bespoke design that ensured the website would be able to be used as the recruitment tool they needed. VetPartners particularly wanted to stay away from having a lot of text content on the site and, on speaking to the management team, it became particularly evident that they would like to deviate from the traditional design of having the main nav at the top. As such we’ve used a grid style design on the right hand side instead. The idea being that we can then echo aspects of this design throughout the extranet for members, and possibly the individual practice sites too, to make use of the new distinctive signature VetPartners look. We’re now looking forward to continuing our relationship with VetPartners as they grow, and to working on the future projects with them. If you’d like to discuss your project and how we can get involved please get in touch and we’ll get the ball rolling for you.